Environmental campaign groups have been conducting a poll across west London on whether residents support government's plans for Heathrow expansion. Friends of the Earth and World Development Movement conducted the surveys in several areas. Residents in Ealing, Hounslow, Richmond, Kew and Osterley Park were asked whether they would holiday more in the UK and forgo trips abroad. The poll coincides with the week-long climate change camp set up at Heathrow. The results of the poll will be handed over to local MP Susan Kramer outside Kew Gardens. 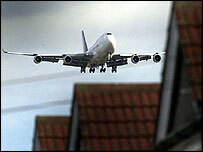 The environmental groups said proposed expansion of Heathrow airport would increase air and noise pollution in the area and will result in the demolition of 700 houses.